There are many software options to rip your dvd on your Windows or Mac. MacX DVD Ripper Pro stands out among similar DVD ripper software in market by speed, quality and DVD encryption ability. Now, in cooperation with MacX DVD Software (developer of MacX DVD Ripper Pro and sponsor of this giveaway), we can offer 40 license code to activate the Full Version of MacX DVD Ripper Pro, each worth $49.95 (20 license code for MacX DVD Ripper Pro For Mac, and 20 for MacX DVD Ripper Pro For Windows). MacX DVD Ripper Pro is an ultimate DVD backup and ripping solution to backup DVD to hard drive or USB, while preserving original quality and rip DVD movies into different video formats. It accepts a myriad of video formats such as FLV, AVI, MP4, WMV, MOV, MPEG as output formats, as well as the ability of ripping DVD straight to iPhone, iPod, iPad/iPad 2, PSP, Apple TV, Zune, Zen, etc with stunning speed. MacX DVD Ripper Pro is also able to access all types of DVD protection technology including CSS encryption, Sony ARccOS encryption, RCE Region protection, Disney X-project DRM, etc. 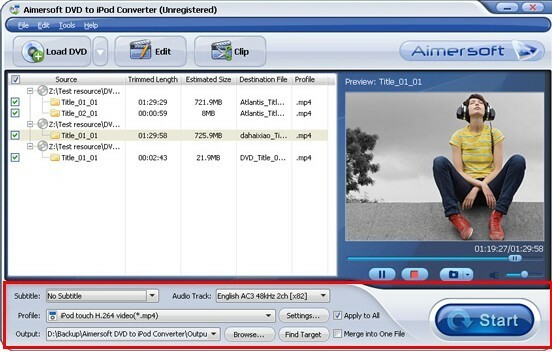 Support ripping DVDs to AVI, MP4, MPEG, FLV, AVI, iPhone 4, iPad, iPod touch 4, PSP, Apple TV, etc. Updated: It’s the time to close this giveaway. Sorry to those that missed it! To avoid missing promotions in the future, consider Subscribing to Our blog via email or via Rss. 3, Then write a comment in this post to tell us which version you need (Mac version or Windwos version). I will sent you the license code in 24 hours after you leave a comment. The Giveaway will end when all the license codes have been given out, or on March 31,2011. Please note that the license code should be used before March 31. 2011, Once the program has been activated, it could be used and kept without any function limitation as long as they don’t reinstall the system. And there will no free upgrade for giveaway version. At last, Thanks Sarah from MacXDVD Software. @N Turn: I am sorry but this giveaway has already been closed. To avoid missing promotions in the future, consider Subscribing to Our blog via email or via Rss. Hi, dae_soe: Your free license code has been sent. Please check for it. With best regards. @Prince: Your free License Code For MacX DVD Ripper Pro ( Windows edition ) have been sent to your email. Please check for it. With best regards. Hi, kaka: Your free license code has been sent. Please check for it. With best regards. Hi, rider2007: Free License Code For MacX DVD Ripper Pro windows edition has been sent to your email. Please check for it. With best regards. @Darrell: You are very welcome. 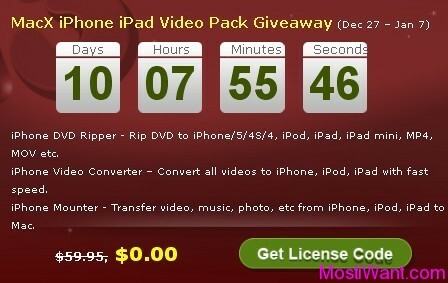 Free License Codes For MacX DVD Ripper Pro ( Mac&Windows edition ) have been sent to your email. Please check for it. With best regards. @Darrell: Sure you can, but which version do you need, Mac version or Windwos version? @alex: Free License Code For MacX DVD Ripper Pro windows edition has been sent to your email. Please check for it. With best regards. @Craig: License Code For MacX DVD Ripper Pro Mac version has been sent to your email. Please check for it. With best regards. @lisette: Free License Code For MacX DVD Ripper Pro windows edition has been sent to your email. Please check for it. With best regards. @Rajesh G: Already sent to your email. Please check for it. With best regards. @Renne: Free License Code For MacX DVD Ripper Pro windows edition has been sent to your email. Please check for it. With best regards. thks, can i have mac version. @Tim: License Code For MacX DVD Ripper Pro Mac version has been sent to your email. Please check for it. With best regards. @WhiteMage: License Code For MacX DVD Ripper Pro windows version has been sent to your email. Please check for it. With best regards. @Bobby: License Code For MacX DVD Ripper Pro windows version has been sent to your email. Please check for it. With best regards. Thank you very much! Have a nice day. @VaaLdrin: Already sent to your email. Please check for it. With best regards. thanh you for share. i like mostiwant blog! @provn: You are always welcome. Do you need one? Many thanks 4 the giveaway! @marian: License Code For MacX DVD Ripper Pro Mac version has been sent to your email. Please check for it. With best regards. Hi!Thx fer da offer,i need a window version key.Thx again. @Tarek: License Code For MacX DVD Ripper Pro windows version has been sent to your email. Please check for it. With best regards. I need a Windows versiion. @spiderwick: License Code For MacX DVD Ripper Pro windows version has been sent to your email. Please check for it. With best regards. @tanvir: License Code For MacX DVD Ripper Pro windows version has been sent to your email. Please check for it. With best regards. @Mayur: License Code For MacX DVD Ripper Pro windows version has been sent to your email. Please check for it. With best regards. @dumi: License Code For MacX DVD Ripper Pro windows version has been sent to your email. Please check for it. With best regards. Please leave another email and i shall sent the license code to you again. With best regards. @aol: License Code For MacX DVD Ripper Pro windows version has been sent to your email. Please check for it. With best regards. @Aa: License Code For MacX DVD Ripper Pro windows version has been sent to your email. Please check for it. With best regards.